Listen Up Philip was and remains the only film I've seen from director Alex Ross Perry. This is not due to the fact I disliked the film, in fact, I rather enjoyed it if not being completely enthralled with it as some of the responses suggested I should. Perry has been quick to write and direct his follow-up though which certainly produces some interest given this first, very on the nose trailer. 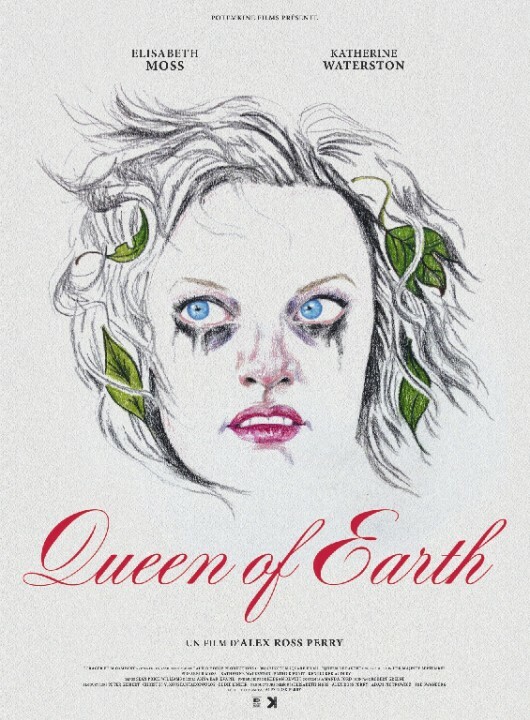 Carrying over from her supporting role in Philip, Elisabeth Moss headlines Perry's latest, Queen of Earth, with Katherine Waterston (Inherent Vice). Telling the story of two women who grew up together and discover they've drifted apart when they retreat to a lake house together seems to essentially be the set-up for some kind of psychological breakdown on Moss's characters part. While this first look is very intentionally in the vein of something we might have seen in between Quentin Tarantino and Robert Rodriguez's Grindhouse double feature it is more the highlighted critical praise and washed out aesthetic that have me intrigued than anything concerning the story. This may not lend well to what the finished product may or may not turn out to be, but as a teaser it works immensely. I can appreciate what the director is going for and it is clear from his single prior work I've seen that he has a knack for writing very precise characters and thus very cutting dialogue. I can only hope this character development and promised psychological breakdown match the allure of the cinematography and tone being purported in the trailer. Queen of Earth also stars Patrick Fugit, Kate Lyn Sheil, Kentucker Audley, Keith Poulson and opens in limited release on August 26th. Synopsis: Catherine (Elisabeth Moss) has entered a particularly dark period in her life: her father, a famous artist whose affairs she managed, has recently died, and on the heels of his death she’s dumped by her boyfriend James (Kentucker Audley). Looking to recuperate, Catherine heads out to her best friend Virginia’s (Katherine Waterston) lake house for some much needed relaxation. However, once Catherine arrives relaxation proves impossible to find, as she is overcome with memories of time spent at the same house with James the year before. As Catherine reaches out to Virginia with attempts at connection, Virginia begins spending increasing amounts of time with a local love interest, Rich (Patrick Fugit), and fissures in the relationship between the two women begin to appear, sending Catherine into a downward spiral of delusion and madness. A bracing, eerie look at the deep bonds of friendship and the horrific effects of such bonds being frayed, Queen of Earth is a thrilling examination of a deeply complex relationship between two miserable women.